Catnip has a wide native range that extends from Southern and Eastern Europe, through the Middle East and Central Asia and as far east as China. Catnip is named for the cat-attracting properties of the oil contained within its leaves, although it only has an effect on two out of every three cats. Cats aren't the only critters that find catnip irresistible, the profuse, pale-purple flowers of catnip are great for attracting bees and butterflies to the garden. The scent of catnip leaves is repellent to aphids and squash bugs, making it great for companion planting around brassicas, cucurbits and other susceptible plants. The compound iridodial found in the leaves is attractive to lacewings whose immature larval stage also feeds on aphids. Oil extracted from catnip leaves via steam distillation can be used as an mosquito repellent. Catnip is easy to grow and will grow quickly in most gardens. This however can become a problem as it'll spread like mint and you'll need to trim the runners regularly if you want to keep it in check. Pinch back catnip stems tips regularly to encourage them to branch out and become bushier. Catnip will grow and flower well in full sun or in part shade. Catnip is drought tolerant and once established should only need watering during prolonged dry spells. Catnip is fairly tolerant of poor soils but will grow best when planted in a free-draining soil rich in organic matter. If your soil is sandy, heavy with clay or pale and lacking in organic matter you can improve it by placing down a layer of compost or well-rotted manure prior to planting catnip. Worms and soil micro-organisms will help to incorporate the organic matter through the soil improving its structure, drainage and fertility. Catnip shouldn't require any additional fertiliser to do well, but if growth is slow or at the first sign of leaf yellowing or other nutrient deficiencies top dress around your plants with a complete organic fertiliser. Catnip is frost hardy once established. In temperate, cold or mountainous regions of Australia sow catnip seeds during Spring or Summer as long as any chance of frost has past. In subtropical and tropical regions of Australia sow catnip seeds during Spring, Summer or Autumn. Catnip seeds are small so cover them only very lightly with a fine sprinkling of growing media. Press down gently to ensure good contact between the moist growing mix and the seeds, doing this will help prevent the seeds from drying out between watering. Catnip seeds are best started in small trays and then pricked out into individual punnet cells as soon as they are big enough to handle. When planting out catnip seedlings into the garden you should space them about 40cm apart as they will trail and require lots of room to grow. Water young catnip seedlings regularly. Catnip seeds can have slow and erratic germination taking from 7 to as long as 20 days to germinate after sowing. 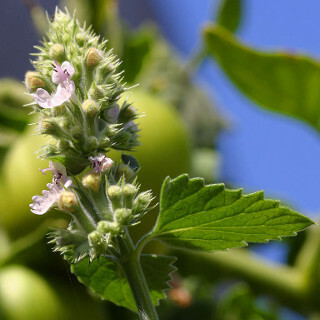 Catnip plants take 4 to 5 months to grow large enough to mature and begin flowering. Catnip is a perennial and will continue to grow and flower year after year, although it may die back during Winter it'll re-shoot the following Spring.